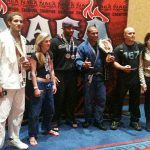 Coaches Eli Hawkins and Luciano Fonseca are having success with the newly opened martial arts center, Vineyard MMA, on Holmes Hole Road, Vineyard Haven. 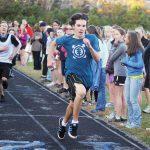 One hundred twenty runners ran or walked the seventh annual 5K for KJ (Kevin Johnson) on the high school's cross country course through the State Forest, Saturday. 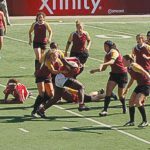 Katelyn Mahoney, daughter of Al and Susan Mahoney of Oak Bluffs and a 2008 graduate of Martha's Vineyard Regional High School, is playing in her fourth season for the Boston College Eagles women's rugby team. Two hundred forty-four stout souls braved the wind and chill of Thanksgiving morning to run the Oak Bluffs 5K Turkey Trot road race, setting a new record for participation in the annual run. Martha's Vineyard's 8th grade girls basketball team played in the Kim Craft Tournament at Falmouth Academy last weekend and won all three of their games. 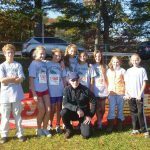 The annual Oak Bluffs 5k Turkey Trot Thanksgiving day race takes off from the OB Police Station at 8:30 am. Friday's bone-chilling, formidable wind could not cool the ardor of the Martha's Vineyard varsity and junior varsity football teams and their loyal fans, at Dan McCarthy Field. Both the boys and the girls cross country teams have qualified for the state meet at Franklin Park, Saturday, to compete with the best, not only from the Eastern Division but also from the Central and Western Divisions. The third meeting of the Martha's Vineyard high school boys soccer team with Bishop Feehan proved to be one too many as the visiting Shamrocks handed the Vineyarders a stinging 3-1 defeat in the opening round of the Massachusetts Interscholastic Athletic Association Division Two state tournament, Sunday afternoon, at Dan McCarthy Field. 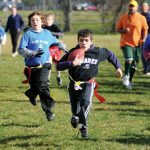 The Martha's Vineyard Boys and Girls Club Flag Football season came to a close on Saturday with three bowl games, all of which were nailbiters. Madison Hughes, a senior at Martha's Vineyard Regional High School, will sign a national letter of intent, Monday at 10 am in front of the trophy case adjacent to the high school gym, to play division one girls lacrosse at Central Connecticut State University in New Britain, Conn.
Friday, at North Dartmouth, the Vineyarders notched their second Eastern Athletic Conference victory, with an 18-14 win over the Bishop Stang Spartans. 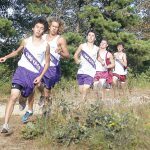 Eight Vineyard youngsters ran in the Mass State Middle School Cross Country Meet, last week in Tewksbury, with the following results. The Martha's Vineyard boys varsity soccer team defeated Bishop Feehan at Attleboro, Tuesday, 4-2, improving their season record to 10-4-2. It was no contest at Dan McCarthy field, Friday, when Bishop Feehan came to play; football, that is. The Vineyard incurred two Nor'easters this weekend. 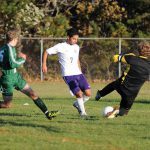 The Vineyard boys soccer team invaded Somerset Berkley, Tuesday, and clinched the Eastern Athletic Conference title with a 3-0 win on goals by Jacob Lawrence, John Marcal, and EAC leading scorer Jack Roberts. 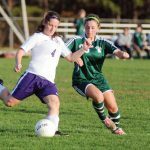 Friday, the MV girls soccer team won its first game of the year, defeating Cape Tech at Harwich, 3-0. 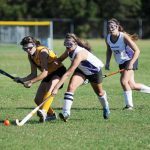 Maggie Johnson scored the only goal, unassisted, in the Vineyard field hockey defeat of Nauset, here, Saturday, improving the team's record to 5-7-3. Winning half of the eight events, the West Tisbury girls team ran away from the opposition in the final Interscholastic Pentagonal Track and Field meet at the high school, Friday.